As India heads toward elections beginning this week, taking up arms for “mother cow” is part of a broader campaign to impose ancient Hindu religious values across a multicultural country. As with similar movements across the world, Hindu nationalism, once fringe, has now taken a central place in India’s politics. The movement is led by the party of Prime Minister Narendra Modi, who grew up chanting slogans and practicing maneuvers at nationalist training camps. Modi and his Bharatiya Janata Party seek to retain power in the elections by promoting Hindutva — a Hindu way of life — instead of secular pluralism. A fresh mandate for Modi could embolden efforts to mold the world’s largest democracy of 1.3 billion people into a stringently Hindu nation. 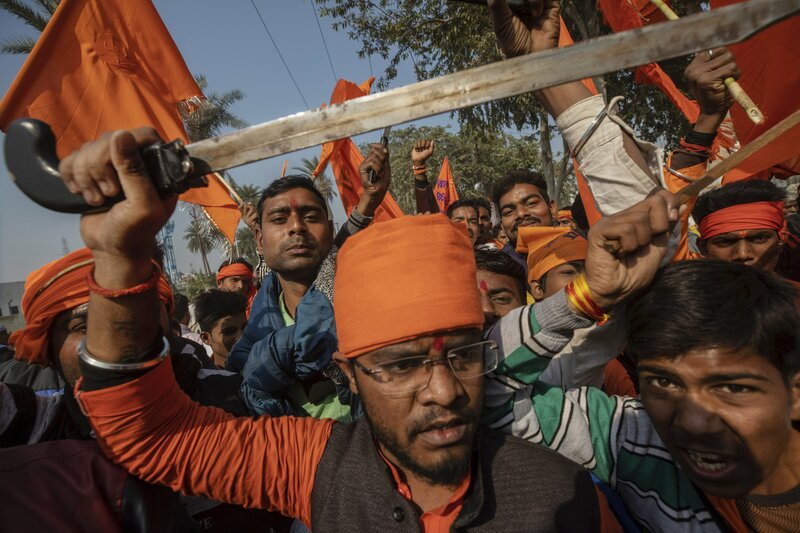 In New Delhi and Ayodhya, a city in Uttar Pradesh state, tens of thousands of men in saffron armed with swords and the name of the Hindu Lord Ram painted on their foreheads shouted anti-Muslim epithets. They demanded a temple to Ram at a site where Hindu hardliners tore down a 16th-century mosque in 1992, sparking riots that left about 2,000 people dead. Hindu groups say the mosque was only built after Muslim invaders destroyed a temple dedicated to Ram. Elsewhere in Uttar Pradesh, the government spent unprecedented sums on the Hindu Kumbh Mela festival that ended last month, with Modi and the chief minister, Yogi Adityanath, himself a Hindu monk, appearing in countless posters. Three months earlier, Adityanath’s state government replaced the Muslim name of the host city, Allahabad, with Prayagraj, a Sanskrit word from Hindu religious texts. The name change from Muslim to Hindu is one of many in recent months. A Modi-appointed committee of scholars is also studying DNA samples to prove that today’s Hindus are descendants of India’s first inhabitants, and to establish that Hindu scriptures are fact and not myth. About 280 people were injured in more than 100 attacks by vigilantes between May 2015 and December 2018, Human Rights Watch said in a recent report. Kamal’s group has been involved in some of the most gruesome assaults on suspected cow smugglers. “Violence is wrong but if the matter involves protecting a mother, all is fair,” Kamal said. At least two men involved in assaulting suspected cow smugglers are also candidates in the upcoming parliamentary polls. Even the opposition Congress party, long associated with the secularism of its co-founder and India’s first prime minister Jawaharlal Nehru, has pushed to protect cows. In Congress-controlled Madhya Pradesh state, authorities jailed two men suspected of illegally transporting cows under the National Security Act, which allows for detention in cases of threats to state security.